The new Mid-Season Reinforcements are arriving with force and introducing major changes to Tachanka, a new map in PVP, operator and weapon balancing, and many bug fixes. These Mid-Season Reinforcements arrive on Thursday, December 15, 2016. On November 13th 2016, Alexsandr Senaviev was declared clinically dead for two minutes on the field. While he recovered at the Hereford Base, his mounted RP-46 Degtyaryov Machine Gun was inspected. Having been decommissioned in the 1960s, the RP-46 Degtyaryov was one of the last machine guns manufactured by the Soviet Union. Aware of the Operator’s preference for such antique pieces, Six asked for the weapon to be upgraded to meet safety measures. The team of engineers led by Elena “Mira” Alvarez Del Manzano added a ballistic shield that protects the head from frontal shots. This shield can be destroyed separately from the rest of the turret. Mira was also tasked with adding a light customization on the Mounted LMG as a personal touch for Tachanka. Since the launch of Rainbow Six Siege more than a year ago, Tachanka has been the weakest Operator, even if he has become one of the most loved. This has most clearly been reflected in his pick rate, which is the lowest in the game. 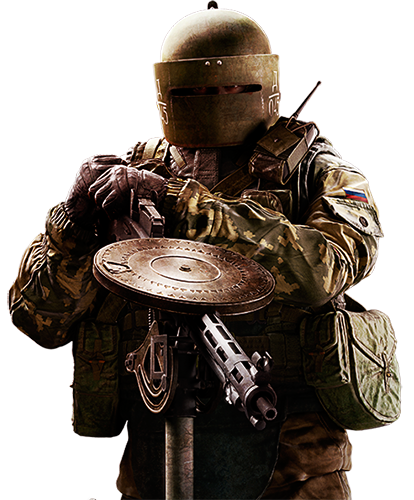 When looking at Tachanka, the biggest downside lies in the gadget. The tradeoff between his turret’s stopping power and his lack of mobility isn’t good enough. Attackers have several ways to deny him with the element of surprise, and can easily headshot him once they know his position. In order to introduce a counter to this weakness, we’ve added a shield in front of the turret which protects him from frontal headshots. The objective is for Tachanka to be the king of the angle that he positioned into, while being very vulnerable to other angles. The shield can be broken separately from the rest of turret and has 500 HP. We’ve also added recoil and a little bit of spread to the gun, in order to mitigate the strength of the shielded turret in spawn peek situations (long distances). 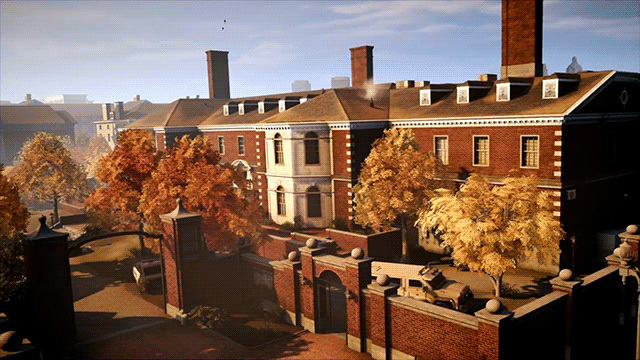 Launching with the Mid-Season Reinforcement patch is the Bartlett University map redesigned for PvP. The map used to only be available in PvE and is going to be available for everyone starting December 15th, 2016. The newly redesigned map removes all the gas and PvE elements from the original design, and introduces better destruction, improved visual layout for better orientation, and a new two-layer destruction. Fuze is getting an additional Cluster Charge and each sub-grenade has a larger radius. Fuze is literally a hit or miss Operator. We wanted to help him be more on the “hit” side of things while not making him too frustrating to play against either. He’s getting an additional charge to apply offensive pressure more often throughout the round. That change alone would not have changed much on itself since it’s rather easy to dodge the pellets. That is why we are also making the radius of the pellets’ larger, from 2.5 meters to 4.2m. As it was before, the lethal area for all armor types was up to 1.2m. From 1.2m to 2.5, it would be non-lethal damage except for light armor who only suffered non-lethal from 2m to 2.5m. We are expanding the zone of non-lethal damage up to 4.2m. 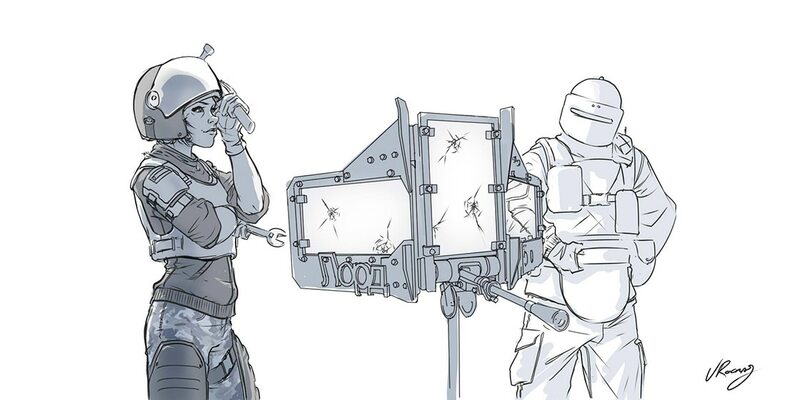 This should help Fuze move Defenders out of rooms, exposing them to other Attacker’s fire or preventing them from holding crucial lines of fire. Have at it, and be careful of where the hostage is before detonating those Cluster Charges! We’ve added a fourth Battery to Bandit. Batteries are relatively easy to get rid of in most situations, and defenders need some help countering Thermite and Hibana wall breaching abilities. Smoke’s Gas Canisters follow the nitro cell curve and speed when thrown; however, we want to give him better deployment options for his gadget. In 5.2, we’ve replaced this with a normal Frag Grenade throw curve. In this episode of a series of very fortunate nerfs: Blackbeard. His killing power is without a doubt the greatest in the game right now. He has one of the highest pick rates, as well as the highest kill/death ratio of all operators. Because of his shield, he is able to out-trade almost anyone in any situation. That is a problem. Blackbeard’s role is meant to hold an angle while being fully covered and catching rotating defenders. Right now, he excels at doing that while also excelling at getting kills in about any situation. This change is going keep him strong at his role of holding angles while making sure he isn’t as strong at running and gunning. As you may know, Assault Rifles (“AR”) are much stronger damage wise than Submachine guns (“SMG”). As a way to balance them, they also have more recoil. In some cases for the Defenders, some submachines guns had recoil that was significant enough to make them unappealing. We are trying to reinforce our balance vision of AR vs SMG’s. AR’s have high recoil and high damage while SMG’s have low damage and low recoil. These four changes to the Caveira, Frost, Castle, Pulse, and Smoke’s weapons are going in that direction. Their recoil has been reduced and it should give the player improved accuracy with those weapons. Before we delve into the changes here is a legend for most of the terms you will see below. Gun rise: The general rate at which the weapon will rise after each continuous shot. Diamond Shape: General recoil shape. First shot recoil: How big of a jump the recoil will have after the first shot is fired. Centering Time: Time it takes for the weapon to center itself back after a shot or a series of shots. Recoil Increase: How much more important the recoil becomes after each continuous shot. Maximum Recoil: The maximum intensity the recoil will reach after firing a series of shots. Note that the changes below are not platform specific. So if you’re using a gamepad on the PC, it will still register the gamepad inputs. Reworked diamond shape to have less vertical pull. After a lot of feedback received by the community and pro league players, Glaz’s OTS-03 is getting a much needed buff. It was too difficult to chain shots quickly one after the other on a moving target and that is why we are making it easier to do so. Rate of fire has been increased from 110 to 220. Reworked the diamond shape to have less horizontal pull. That is it for the major weapon changes. The following weapon tweaks are mostly minor and aim to better categorize them amongst their respective weapon type. Most Assault Rifles should have the same kind of recoils, and so should all Submachine guns and so on. This should make the way recoils behave a lot more consistent within their weapon type. The second types of minor weapon tweak are mostly reduction of some parameters that we felt make the recoils hard to control on a gamepad. Note: Some of these buff and nerfs look like they are important but the original values were so small that even if it’s tripled, you won’t feel that extreme of a change. Reworked the overall recoil for both KB&M and Gamepad as it had a lot of legacy values (the old way we use to do the recoils). It is hard to compare it from the previous version to this new one. Try it out and see for yourself. Reworked diamond shape for it to pull less in all directions. In general, Shield Operators are currently too weak. One of the reasons is how easily they get countered by explosives like nitro cells. Because of this, we have implemented a system that make shields offer directional resistance versus explosions. When an explosion occur close to a Shield Operator, it will now take into account how much of the Operator’s body was protected from the explosion by the shield. Every body part that is fully covered by the shield will resist up to 80% of the explosion damage, and the total damage will take into account which body parts were hit. Feet and hands take less damage than torso and head, for instance. Typically, a nitro cell thrown in front of a shield will be a lot less of a threat – but one that is carefully thrown behind a shield will force him to make a hard choice: look back at it to mitigate damage while being exposed, or keep advancing forward and hope the explosion won’t be close. Note that this does not apply to Blackbeard, or Tachanka. The Impact Grenade now uses a radial explosion for a more consistent hole shape. Explosions now create holes that decrease in size with the distance. The Frag Grenade now uses a radial explosion for damage near the frag itself and shrapnel destruction at longer ranges. FIXED – If a player has Rook’s armor equipped, a neck shot will result in a DBNO state, as opposed to death. This was leading to an increase in “Headshot, Injured” events. FIXED – Shield Operators impacted by a Flash effect (Blitz shield or Stun Grenade) no longer hold their shield properly. FIXED – A hitbox mismatch occurs when manually reviving a DBNO Operator that is using a gadget/camera, and shooting them with Doc’s Stim Pistol at the same time. FIXED – The muzzle break attachment hides the flash on secondary weapons. FIXED – Headshot bonus is awarded when landing a melee kill, even if a headshot was not performed. FIXED – Players are able to vault from certain windows, even when a vault prompt is not presented. FIXED – Barricades are sometimes vaultable prior to reaching the intended amount of destruction. FIXED – Melee animations are not properly represented when attacking from a crouched or prone position. FIXED – Defenders are able to circumvent the “Enemy Detected Outside” message by standing close to a reinforced wall. FIXED – Players sometimes see a “Press F to enhance” prompt. FIXED – Players receive threat indicators when being shot by suppressed weapons. FIXED – Nitro Cells and Smoke’s Beauties can be thrown outside during the Preparation Phase. FIXED – Interrupting a revive action will cause an Operator’s weapon to disappear from 1st person view. FIXED – Destruction of walls and barricades does not replicate properly on all clients, and can lead to rubberbanding. FIXED – Idle animations have too much movement with the shield out, thus making Blitz vulnerable. FIXED – Points are not properly awarded for deploying more than 2 Shock Wire Batteries. FIXED – Master Key device is not consistently destroying studs in walls on all maps. (This is a work in progress). FIXED – Players are able to disconnect before the completion of an interrogation and prevent it from completing. FIXED – Capitao loves his tactical crossbow so much that he sometimes does not equip his primary weapon when a player tries to switch weapons during the Article 5 mission, or while reloading. FIXED – The color of the magazine for Capitao’s crossbow does not always change colors as intended. FIXED – Damage is not received by the Asphyxiating bolts if they are fired at the head. FIXED – Interrupting a crossbow reload by sprinting will result in an incorrect ammo count. FIXED – Self-heal persists through the end of round replay. FIXED – Revive animation is broken when a player is revived by the Stim Gun. FIXED – Destroyed Cameras are still present when using the RED Mk III “Spectre". FIXED – The Welcome Mat is sometimes able to trap players through a barricaded doorway. FIXED – Jammer range is not properly depicted during Overtime Match Point. FIXED – Jammer does not properly block remote triggers if the enemy stays within the Jammer’s radius. FIXED – Montagne’s deployed shield is only interrupted by Echo’s drone when struck from the front. FIXED – Points are not awarded for destroying walls with the Breaching Hammer. FIXED – Shock Drone does not have a crosshair during the Preparation Phase. FIXED – The first shock from Twitch’s Shock Drone does not deal any damage. FIXED – Valkyrie’s hitbox does not always register properly when an enemy lands a headshot from the side. FIXED – Destroying the final Black Eye while it is being used will cause the player to automatically switch their viewpoint to Echo’s drone. FIXED – Assist points are not granted when disorienting an enemy that a teammate kills. FIXED – Negative points are not received when hitting a friendly target with Yokai’s Sonic Burst. FIXED – Yokai drone can sometimes clip through the ceiling. FIXED – Drone effect ends when switching to a Camera or Drone. FIXED – Drone effect is decreased when a player vaults. FIXED – The drone will sometimes teleport to the ceiling if switched to Weapon Mode while under a barricade. FIXED – X-KAIROS pellets that are “lost” still appear on IQ’s EDD. FIXED – the 6th X-KAIROS pellet remains a few seconds after exploding. FIXED – X-KAIROS pellets do not always detonate when shot in the corner of a room. FIXED – A brief FPS freeze can sometimes be experienced when Hibana uses her gadget. FIXED – Sometimes Hibana’s gadget is automatically swapped after firing the last salvo. FIXED – After being picked back up off of a jammed wall, the Exothermic charge will sometimes display a “Charge is jammed” message after being placed on a wall that is not jammed. FIXED – In some instances, light coming in from outside can hinder player’s ability to see outside. FIXED – In EXT Parking, the lamp causes a corrupted lighting effect inside of the bar. FIXED – Players are able to vault through a set of wooden panels to clip into the wall. FIXED – Attackers can force a drone through an area with missing collision and move it through the walls of EXT Garage Top. FIXED – A section of the wall in the Executive Lounge Room can only be seen through from one side. FIXED – A section of the 1F Tellers ceiling can be seen/shot through, without the same opening be present in 2F Executive Lounge. FIXED – Newsstands in EXT Plaza have no collision and can be shot through. FIXED – Players are able to shoot from under the stairs through the structure after destroying a part of the wall in Archives Corridor. FIXED – A section of the outside wall in Master Bedroom can be seen/shot through. FIXED – Part of the ceiling above 1F Great Room Stairs has no collision with drones. FIXED – The floor/ceiling between 2F Tea Room and 1F Restaurant has a section that can only be destroyed from below. FIXED – The hostage is able to withstand a significantly reduced amount of damage if revived using Doc’s Stim Pistol. FIXED – The camera view switches between the first and second floor for some rooms of Skyscraper. FIXED – The reloading animation for the P226 does not flow properly while rappelling. FIXED – Players are able to use the location pings while operating a camera or drone. FIXED – Accepting a squad invitation after having your console in “Stand By” mode will result in an error code.